Well the answer, in my opinion, was.....I don't really know! To this day some crusts are better than others and I ALWAYS use the same ingredients! Oh well, my family has yet to complain so I'm going to keep on making Pie Crust the way I do! There are really only a few things, I feel, that are important every time. 1. ALWAYS use cold butter and shortening. 2. DO NOT OVERMIX the dough, this will definitely make it tough. 3. use ice cold water, meaning put the ice in it while your making the dough, THEN toss the ice before you use the water. 4. LET IT REST! All dough needs to rest at one point or another so when its all done, wrap it up and refrigerate it for at least 1 hour. 5. Above all don't get discouraged. Many of pie crust has seen my garbage can and I've started over. That's it. Those are what I think are the most important parts of making pie dough are. 1-3 - 1/2 cup ice cold water (I always measure the water then add the ice cubes) On some days it might even take more than a 1/2 cup. I tend to just use a measuring cup and add the water as needed. In a bowl, mix the flour, sugar, and salt. Add the cold cubed butter and shortening. Using a pastry blender or a couple of knives cut the pieces of butter/Crisco into the flour until it is the size of small peas. Add the ice water (removing the ice first and discard) a little at a time and using a knife or your clean hands lightly mix until the mixture sticks together in a ball. It should be neither wet nor dry but a happy medium. DO NOT OVER MIX. Place two discs of dough in plastic wrap and refrigerate for at least 1 hour. To roll the pie dough out (one disc at a time) place a small amount of flour on a piece of parchment on the counter and working from the middle of the dough, roll outward. Turn continuously to get an even(ish) circle. There will be little bits of butter and shortening in the dough. This is what makes it flaky. When the pie crust is the correct size lightly roll up onto the rolling pin and carefully unroll over the pie plate. . If there is excess cut it to about 1/2" overhang and roll up under the edge of the dough. Next, crimp for a fluted edge using your thumb and pointer finger of one hand and push the dough between them with a finger or knuckle of the other hand to create an indent. Tada! Now you go make one! May be doubled to make two each - double crust pies. Hi Michelle! This is great! I am so afraid of making my own pie crust but this looks simple enough. I can't wait to give it a try! 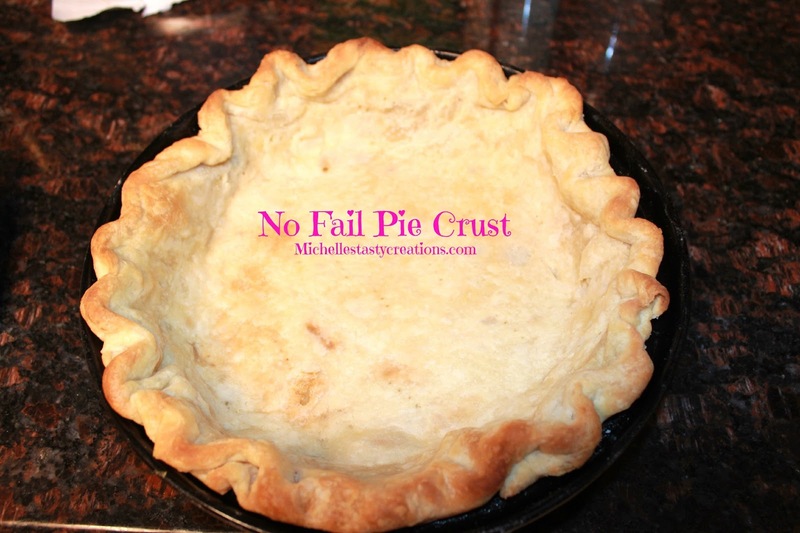 I am hosting a link party on my blog and I would love it if you would stop by and share your pie crust recipe. Have a great weekend!